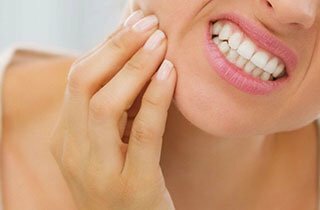 What helps, what can you do to fight toothache? Hardly any pain is as painful and persistent as a toothache. Everyone who has already experienced a toothache at least once in their life knows it. Toothache can either be caused by inflammation or as a result of a dental treatment. The causes of tooth pain vary, but there is always an irritation of the tooth nerve (usually an inflammation) behind it. It is important to always take this pain seriously, even if most of us are afraid of dental treatments. Otherwise – like any long-lasting inflammation – it can lead to long-term health damages in the body. But what to do in case of a toothache? You should definitely consult a dentist because a toothache signals a problem that needs treatment. Putting it off only makes matters worse. But remember: painkillers and home remedies can only offer a temporary solution until you see your dentist. Gingivitis is an inflammation of the gum tissue, caused by bacteria. It rarely hurts at the beginning but it can lead to periodontal disease and even tooth loss. So you should take even the first signs (e.g. bleeding gums) seriously. A regular and thorough oral hygiene is definitely important to prevent gingivitis. When you cannot brush your teeth, mouthwashes can be a good alternative as they have an antibacterial effect. Inflammation of the tooth root is mostly caused by caries (tooth decay), by which bacteria enter the inside of the tooth. Even if a crown (see below) is to be made, the tooth root must be treated. A root canal treatment has many advantages. The most important of them is that you do not lose your natural tooth. This helps to maintain the natural look of your face and smile. Also, if later you need a dental bridge, your preserved tooth can be its support. Do not worry: a root canal should not be painful! As your dentist will tell you, it is normal to feel some pain and sensitivity right after getting your dental crowns or bridges. However, in some cases even after the insertion of the final bridge the patient may feel some discomfort when chewing, or pressure, or sensitivity to low and high temperatures. inflammation of the dental bridge, which necessarily calls for a treatment! In any event whatever causes the toothache, it can be successfully treated and eliminated, so you should not hesitate to contact your dentist. To sum it up: you must take toothache seriously and see your dentist as soon as you can. The good news is that dental treatments are not necessarily painful any more.